President Lincoln signed the Homestead Act on May 20, 1862. It was “an act to secure homesteads to actual settlers on the public domain,” and increased westward expansion through settlement of surveyed government lands in thirty states. The law allowed a homesteader to receive up to 160 acres by applying for a claim, improving the land, and filing for a patent after successfully living on the land for five years. Fold3 has been digitizing the homestead records for Nebraska. The files, from the Records of the Bureau of Land Management, consist of final certificates, applications with land descriptions, affidavits showing proof of citizenship, register and receiver receipts, notices and final proofs, and testimonies of witnesses. They sometimes contain unique records for a person or family, used to verify their right to make the claim. More details and some intriguing examples are on the Homestead Records description page. The 1862 Homestead Act had been debated, proposed, and defeated for over ten years, stalled by the issue of slavery. After eleven states left the Union and a civil war erupted on American soil, the act finally passed. Applications were filed beginning on January 1, 1863. Daniel Freeman, a Union soldier, filed the first claim at the Brownville, Nebraska, land office on that day. In January 1868, he proved his claim. His file includes a statement by neighbors Joseph Graff and Samuel Kilpatrick that Daniel had lived on the land for five years with his wife and two children, and “built a stable, a sheep shed 100 feet long, corn crib, and has 40 apple and about 400 peach trees set out.” He paid $12 for his 160-acre tract of land, or about $226 in today’s dollars (source). Explore Daniel Freeman’s and other Nebraska Homestead Records on Fold3. To learn more about events surrounding the anniversary of the Homestead Act, visit the National Park Service website. Did you know there is a short film about The Homestead Records Digitization Project? 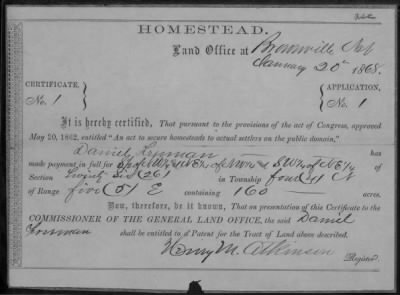 The film shows how the original records of those who claimed land under the Homestead Act of 1862 are being digitized.